I need to keep this one short, but decided it was worth putting up at least some basic graphs given the interesting juxtaposition of an accelerating rate of PPI increases alongside the first decline in core CPI since 1982. 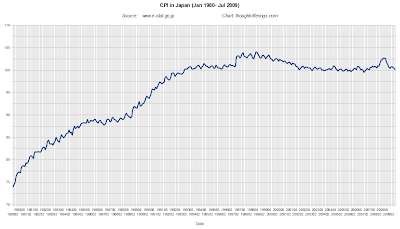 Our avoidance so far of a sustained price deflation remains a big differentiator between then and now, though inflation has slowed more quickly than in Japan's post-1990 experience. Apologies for the crowded chart, but note in particular the continuous downward trajectory of the magenta line for shelter, which is a subset of the larger housing category. This represents a heavily weighted portion (32%) of the overall index. Most other measures are more volatile (in three month terms) and in positive territory, though recreation prices have been deflating for months. 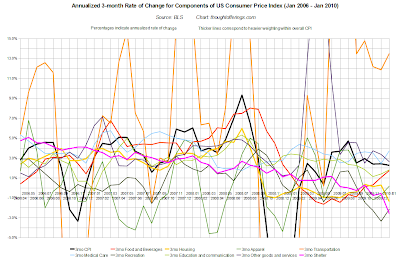 Also food prices (15% of CPI) seem to have recovered and been growing a little more quickly again. Look at the PPI measures for crude, intermediate, and finished goods. 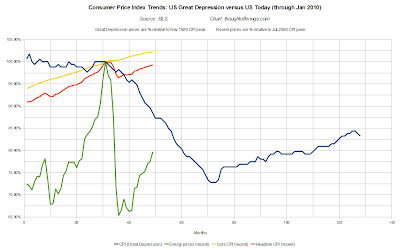 The accelerating price levels bear an uncanny similarity to the trajectory of the 2007-2008 price spike, which begs the question of whether they might crash in a similar way again as well. The answer likely depends on how much commodity prices are being affected by financial market speculation (controversial!) and how sustainable the resurgence in developing market growth is, especially China (the concerns regarding unsustainable private credit growth in China seem very valid). 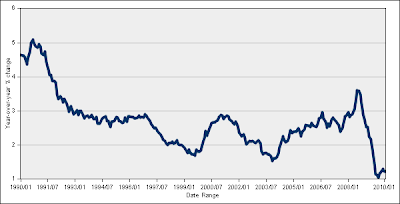 From previous posts, for reference: "The peak of Japan's CPI occurred in October 1998, almost eight years after the stock market peaked, and Japan's notorious mild deflation has been in effect since then. A multi-year disinflation (of core CPI) leading to sustained mild deflation is one possible outcome for the US. 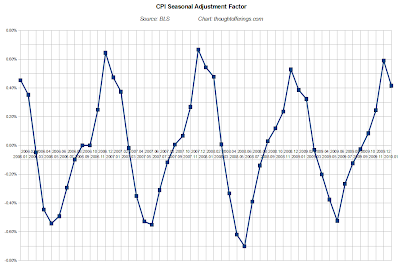 I had previously been using seasonally adjusted figures for all the measures except headline and core CPI, as I assumed as aggregates that those would be smoothed out pretty well, and didn't know how effective the seasonal adjustment process is. 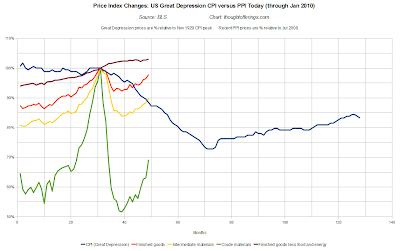 Also the Great Depression data is not seasonally adjusted, nor are many other countries' data (such as within Europe). But there does appear to be an overall drop in prices through every December, and increase through every June, as the graph below shows, so I've switched to seasonally adjusted figures for everything.